Historic buildings specialist and ERO user Edmund Harris writes for us on a hidden gem of Victoriana in the village of Creeksea. This post draws on the Chancellor collection, made up of some 10,000 building plans from the office of noted Victorian architect Fred Chancellor. We are currently two years into a long-term project to clean, repackage and catalogue every one of these plans; find out more here. Creeksea (sometimes called Cricksea) is a tiny village now virtually on the western outskirts of Burnham-on-Crouch, with long, tranquil views to the south over the gentle landscape of the Crouch estuary. Existing literature on the county is mostly likely to send a lover of antiquities there to look at Creeksea Place, a fragment of a once much larger Elizabethan house, possibly also Creeksea Hall and a half-timbered cottage. 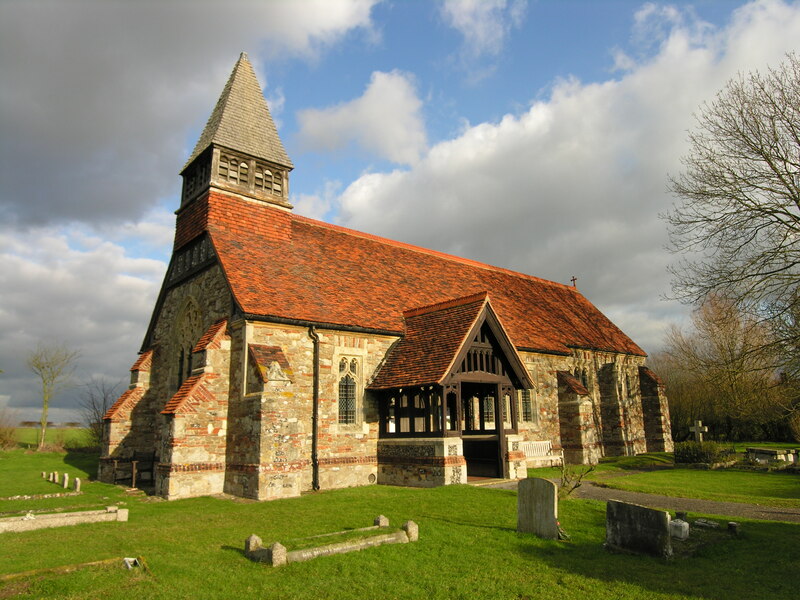 But anyone other than the most steadfastly curious of enthusiasts for Victoriana might well be put off investigating the parish church of All Saints by mentions of a complete rebuild in 1878; Essex has several nationally important and much celebrated 19th century churches but this is not generally recognised as one of them. That would, however, be a great shame, as All Saints is actually a most remarkable building that handsomely repays closer examination. It is indeed almost entirely a rebuild by Frederic Chancellor, but the evolution of his design is far more complicated than one might expect. A splendid set of several dozen drawings in the ERO details an intriguing design process. We know what the predecessor of the present church looked like thanks to a plan and elevations from Chancellor’s office dated January 1877, which show a simple, modest two-cell building, clearly much patched and mended in a rather ad hoc fashion over the years (witness the trusses bridging the buttresses to the west wall on which the bellcote is supported), evidently seated internally with box pews. Today we should say that this gave it charm of as great a value as its antiquity – the round-arched north door suggests Norman origins – but to the Victorian mind such a building would have appeared so badly degraded as to be of minimal interest. It would have suggested a Church of England in decline and looked wanting in pride and propriety. 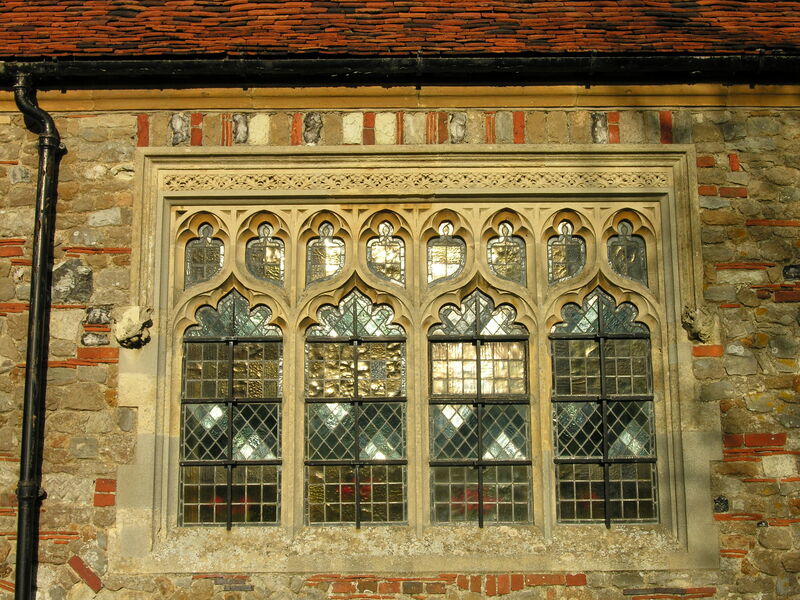 The building would have been unsuited to Victorian liturgical practice and features such as the oblong, probably Elizabethan east window would probably have been viewed as downright inappropriate for a religious building. But Chancellor’s involvement with All Saints in fact seems to have begun well over a year previously. 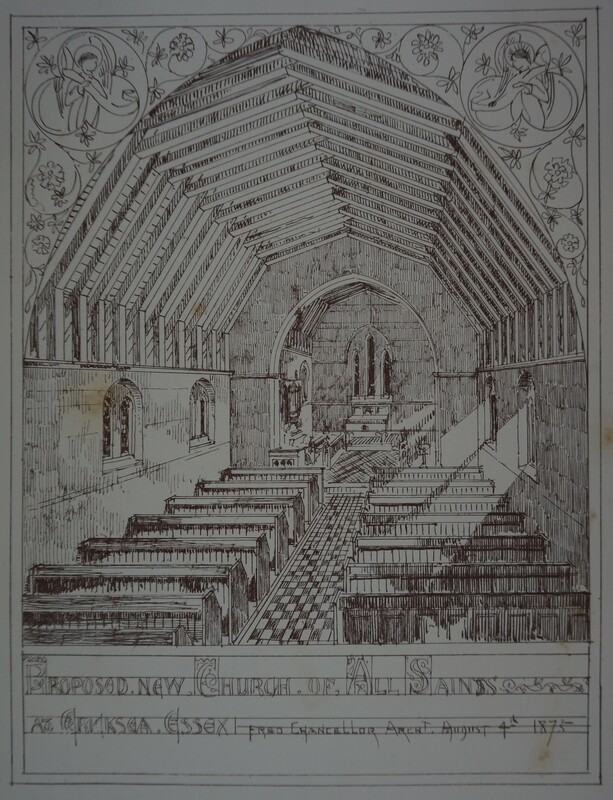 An artist’s impression dated 4th August 1875, shows the interior of what is called ‘a proposed new church’ in a very plain lancet style – decent, but clearly the work of an architect confined by a limited budget. It looks like it might have been intended for publication and may have been no more than a concept sketch. Only one drawing on file gives any more information about it: a view of the south elevation (executed in pencil rather than pen and wash) shows something that is clearly a precursor of what was eventually built but far plainer. Features such as the paired lancets to the side wall of the nave give it very clear affinities with another, this time undated proposal. 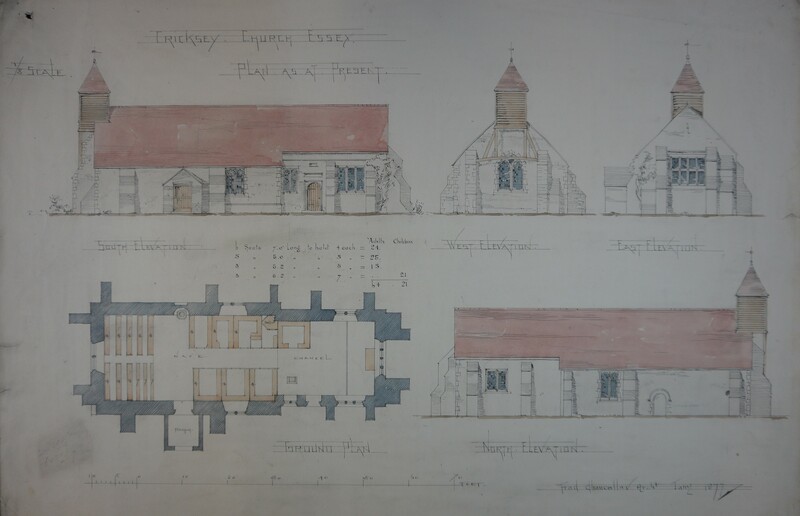 Unlike the August 1875 scheme it was aimed at rebuilding just the nave, but this time was pursued as far as a set of contract-standard drawings. Externally the rebuilt nave appears rather forbidding and Chancellor initially struggled to make a virtue of the building’s simplicity. 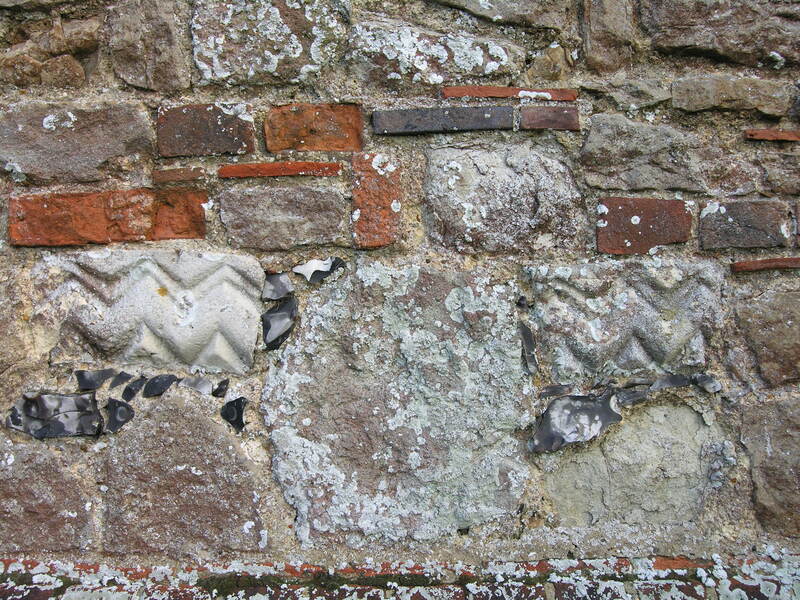 It looks as though it was probably meant to be rendered with only the stone quoins left visible. While instantly recognisable as a product of the High Victorian movement, the building lacks any sort of sense of local character. Which of these schemes came first is a mystery. Perhaps initial plans for a complete rebuild had to be scaled back to replacing just the nave when it became apparent the cost would be excessive, but that is conjecture. 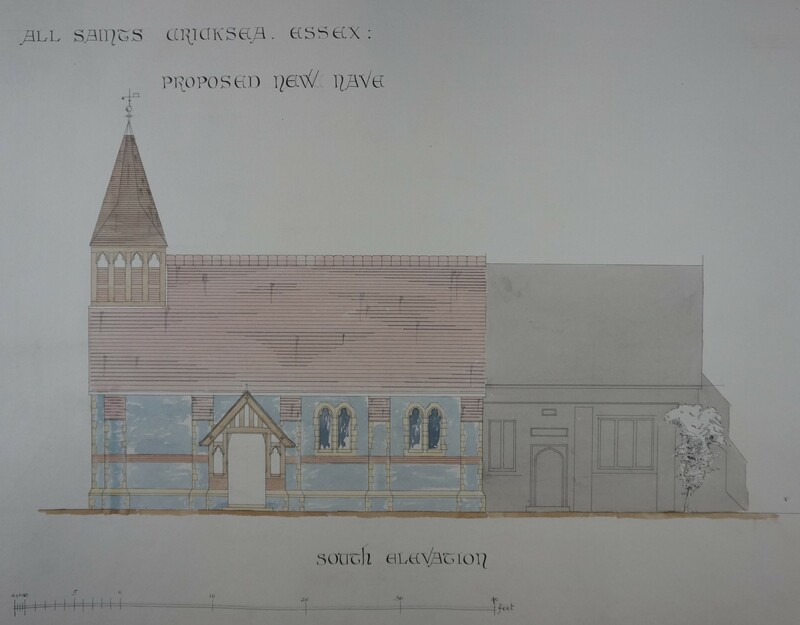 What happened next is not clear, but it is a reasonable bet that finances outstripped by the parish’s ambitions put a check on progress since in December 1876 and January 1877 designs emerged from Chancellor’s office for a restoration of the medieval building. ‘Restoration’ was, as so often the case at this time, something of a euphemism. 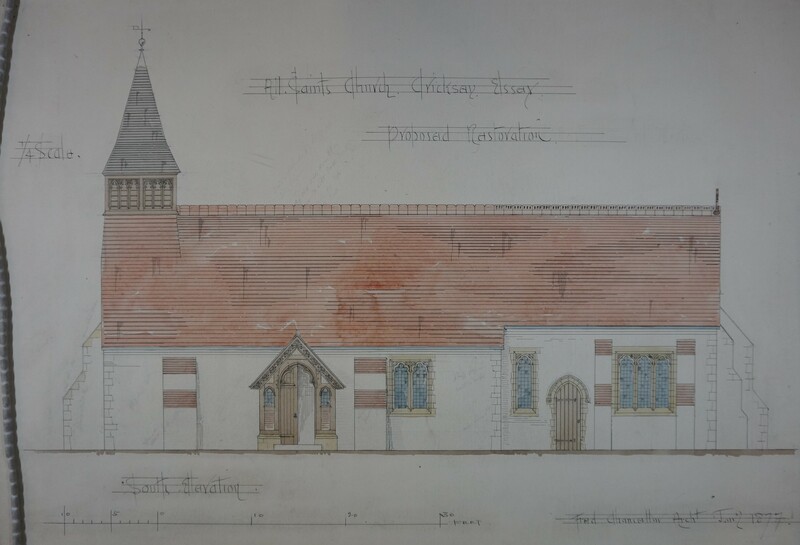 In fact it was nothing less than a comprehensive remodelling since the building was to be refenestrated throughout, the bellcote and roof replaced, the interior refurnished, a new porch added on the south side and a vestry built onto the north wall of the chancel. Probably the pattern of events that led to this was nothing more than an accident, but if so it was a happy one since it seems to have forced Chancellor to take a closer look at the existing building and its character. Picturesque touches such as the partly timbered chancel and vestry gables now appear and generally there is greater care and finesse in the detailing than in the first two designs. Perhaps the condition of the existing fabric turned out to be too poor to withstand such substantial new additions. 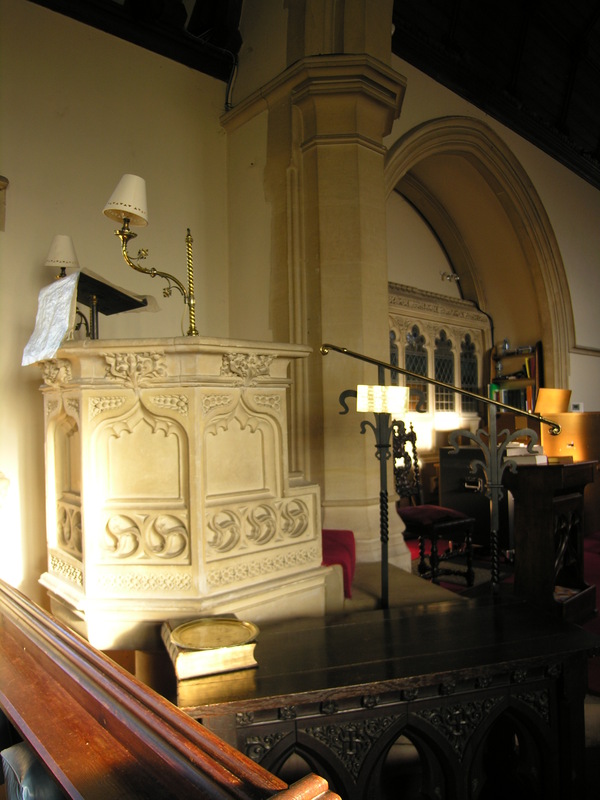 Or perhaps the cost was only marginally less than a complete rebuild and the parish, taking a long-term view, felt that on balance an entirely new building represented much better value for money. Perhaps even a generous sponsor appeared. Without further research neither hypothesis can be corroborated, but the restoration project was not entertained for long and between February and June 1877 Chancellor produced drawings for the nave that was eventually built. 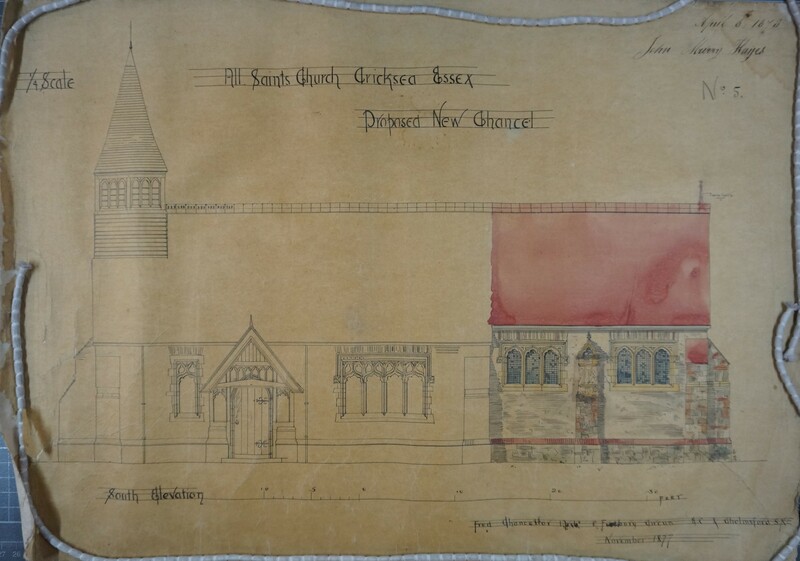 Like the earlier scheme, it shows the medieval chancel left intact, but that seems to have been a temporary expedient – probably only done so that divine service could continue while the work was carried out – since a further set of drawings dated November 1877 and March 1878 depicts the existing structure that superseded it, completing Chancellor’s new church. 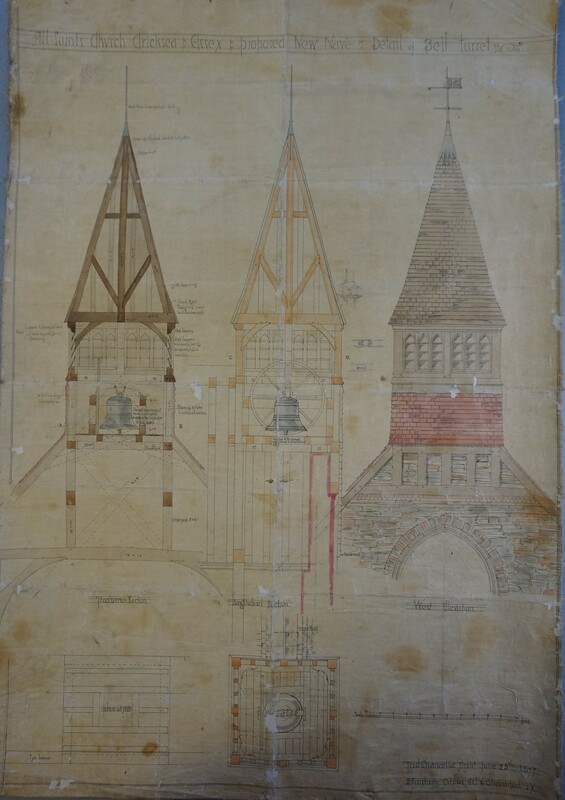 Notably, not just the pen and wash contract drawings survive at the ERO, but also detailed working drawings for features such as the bellcote and porch. So much for the chronology of the design process. Beautiful though these fine examples of Victorian architectural draughtsmanship are, the building that eventually resulted from all these false starts is even lovelier. The contrast with the 1875 initial version of the scheme is striking. The dour lancet style has given way to an ornate, almost fruity Perpendicular Gothic. The lush foliate carving – something shown in a series on file of delicate pencil drawings – that adorns the screen dividing the vestry from the chancel, the large, four-light window on the south side of the nave and the panelled pulpit would not disgrace a far grander building. But the really memorable thing about the church is the wonderful treatment of the walls. 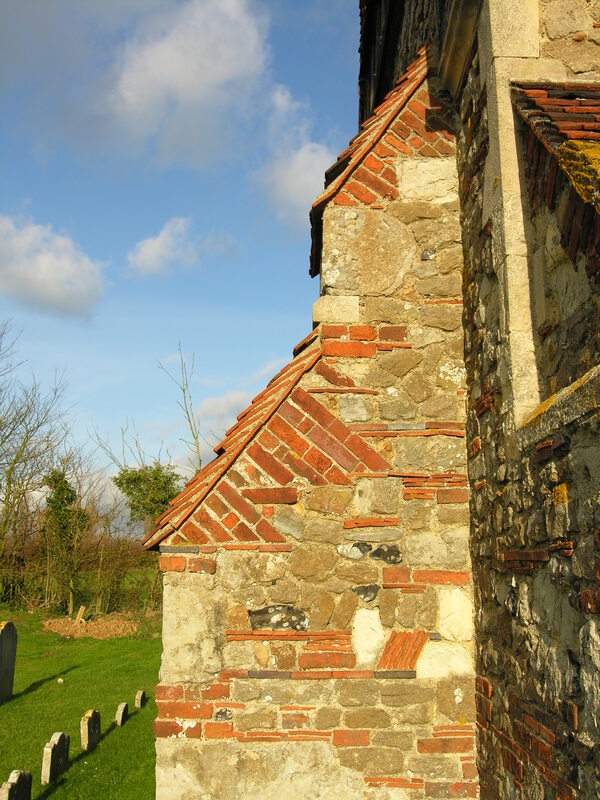 Faced with a lack of good, locally available stone, the builders of Essex’s medieval churches had to press into surface whatever came to hand, from pudding stone to flint to brick from the ruins of Roman Colchester, giving the exteriors of many of them a charming, variegated, patchwork effect. 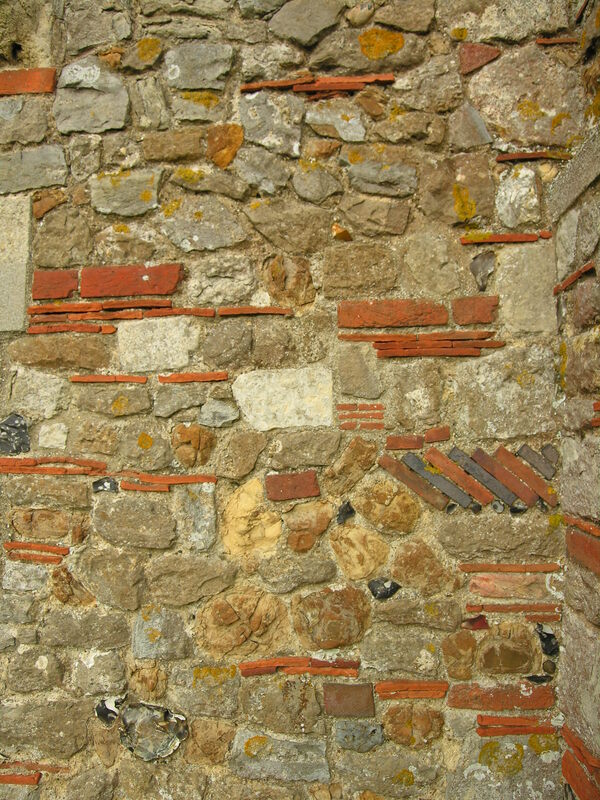 No doubt Chancellor was keen to offset the value of material recovered from the old building against the cost of the construction of its replacement (a fragment of a Norman arch with typical chevron decoration can be seen built into one wall) but he made a real virtue of his economy. This sensitivity to local materials and traditions is remarkable for its date. It would become a major article of faith for leading figures in the Arts and Crafts movement, but not for another decade or so. And while some of those architects were content to let their builders produce the exuberant effects they desired, the drawings show that delightful features such as the striped window heads were Chancellor’s own inspiration. The long wait, the vagaries of the design process and the choice of an architect with local roots paid off. Frederic Chancellor did right by the parishioners of Creeksea. Love it or loath it, football has always had the power to hit the headlines. An article from the ERO’s historic annals of the Essex Chronicle describes an off-pitch outbreak of communal violence associated with the ‘beautiful game’ in Victorian times. 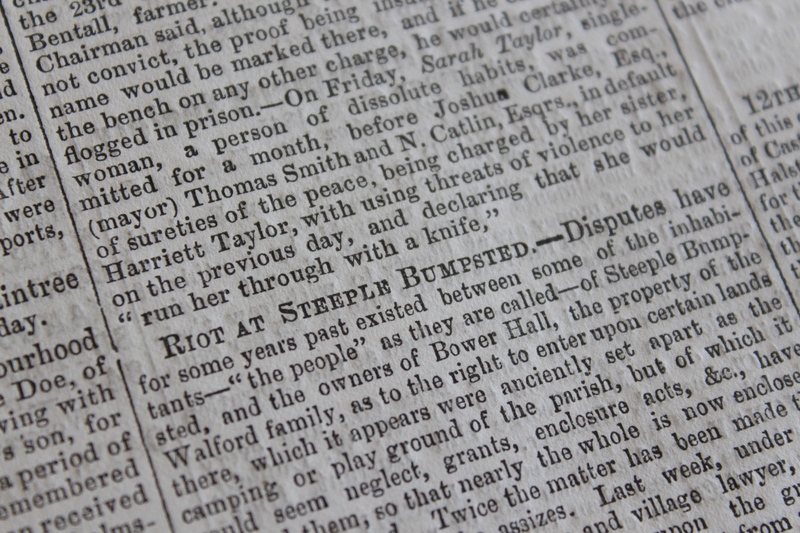 On Friday July 19, 1861 the Chelmsford Chronicle, forerunner of the Essex Chronicle, dramatically headlined a story ‘Riot at Steeple Bumpstead’. What followed was a detailed account of court proceedings recording violent clashes between rioters and the police in the normally peaceful village of Steeple Bumpstead. Parishioners of Steeple Bumpstead had enjoyed the privilege of playing games of various kinds on an area of land in the village known as the Camping Close. The close was said to be part of the land given to the parish by William Helion centuries ago and leased to the Lords of nearby Bower Hall. Over the years the area had gradually reduced with the taking over, or enclosure, of sections of it by the Bower Hall estate for agricultural purposes. Keen on their football, the villagers objected and various incidents of trespass resulted in a boundary, in the form of a ditch, being dug in 1849 by John Snape, then the tenant of Parsonage Farm (part of the Bower Hall estate), to cordon off a part of the Camping Close for his own use. In the eyes of the villagers this was wrong. Snape was encroaching on their playing field. 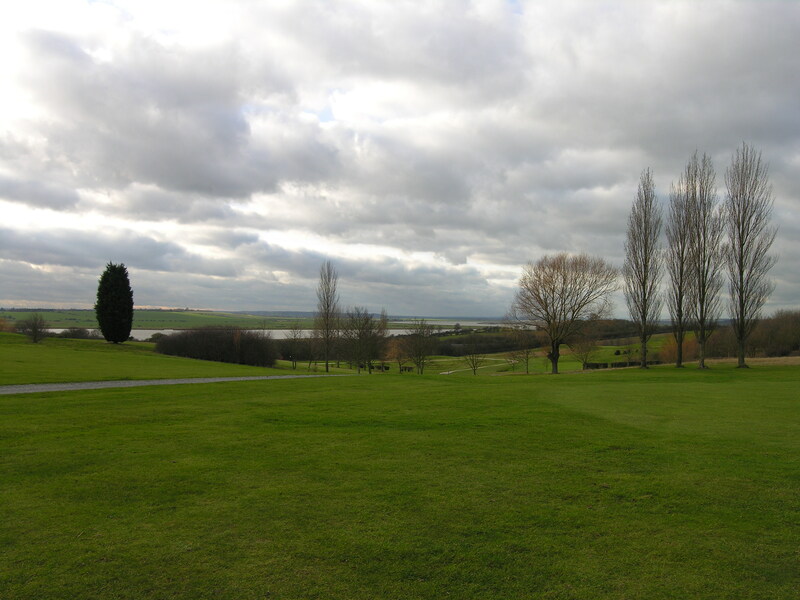 In 1860 (with Snape gone and William Dere now tenant of the farm) their unhappiness resulted in some notable foul play when John Clayden, John Salmon and John Bunton, all described as ‘young tradesmen of Steeple Bumpstead’ moved a pile of manure from the area behind the boundary ditch and scattered it over Camping Close land. Later they returned with 20 fellow villagers to play football over the land, in the process treading the manure into the ground. The three were brought before the magistrate’s court and charged with the offence of damaging a pile of manure. They were found guilty and fined a shilling. The villagers firmly believed in the ancient rights and the case went to appeal at the Court of the Queen’s Bench. Here the conviction was quashed on the grounds that there was ‘reasonable supposition of right’ on the part of the defenders. 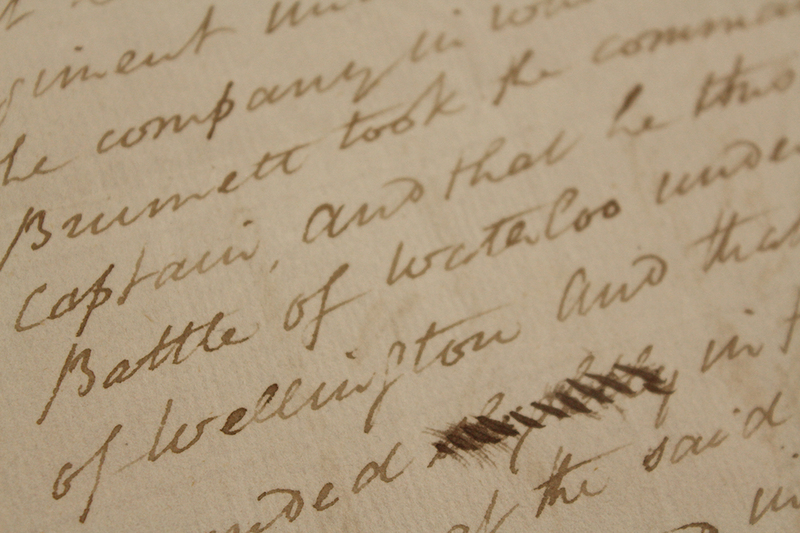 A short time later, encouraged by the verdict, John Bunton, a one-armed veteran of the Crimean War of the 1850s, William Woodham, William Spencer and Charles Willis overthrew a corn rick standing on the disputed area. As a result they were served with a writ by William Dere, to prevent further damage. 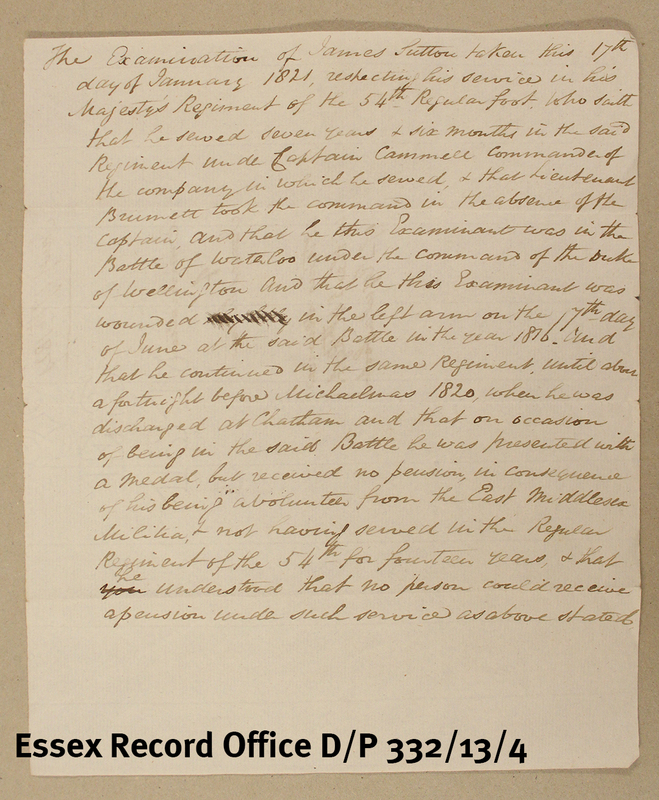 Incensed by the issuing of these writs, in the summer of 1861 a large crowd of villagers led by a man described as a ‘warlike veteran village lawyer’ entered another area of disputed land cutting down a hedge and 74 trees from a plantation. Warrants for the arrest of the five men considered to be the ring leaders were issued, but when the local policeman Constable Robert Spencer tried to execute the warrants he and his colleagues were met with ‘forceful’ opposition amounting to a riot. In the face of such opposition the constabulary withdrew leaving the villagers in command of their Camping Close. The rule of law was upheld the next day with the arrival of John McHardy, the Chief Constable. He met with the leaders and managed to persuade them to attend court in Castle Hedingham. They were committed for trial at Chelmsford Assizes and led to Springfield gaol. John Claydon, 18, shoemaker, Charles Willis, 21 labourer, William Spencer, 18, baker, William Woodham 21, labourer and John Bunton, 25, labourer, were all indicted for their symbolic act of defiance in feloniously damaging trees in a plantation adjacent to Bower Hall Park. 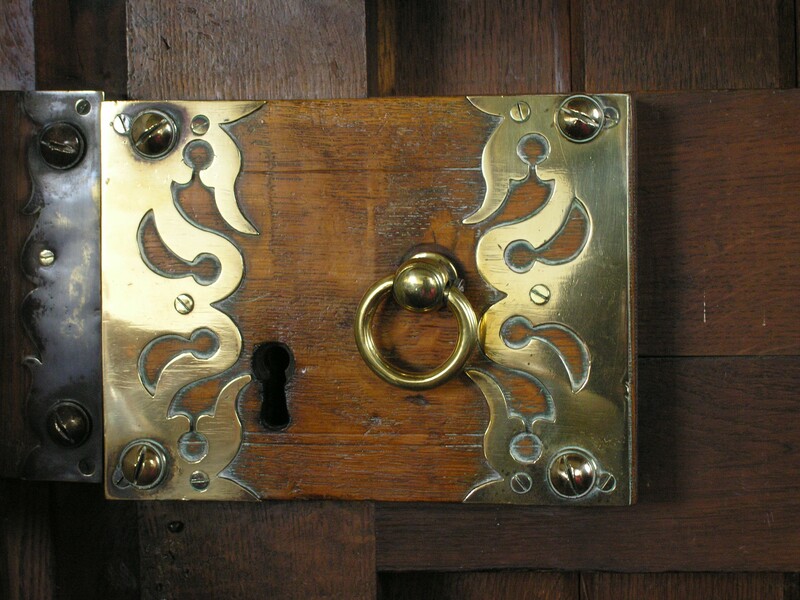 The jury found the Steeple Bumpstead five guilty and the judge imprisoned them for one month without hard labour and to be bound over to keep the peace for two years. Historic newspapers provide a never-ending supply of interesting, odd and surprising details about life in the past, and it’s easy to get lost in them for hours. If you fancy doing just that, make the most of free access to the British Newspaper Archive Online in the ERO Searchroom or Essex Libraries. A version of this article was published in the Essex Chronicle in 2004 but it was such a good story we thought it was worth sharing again. 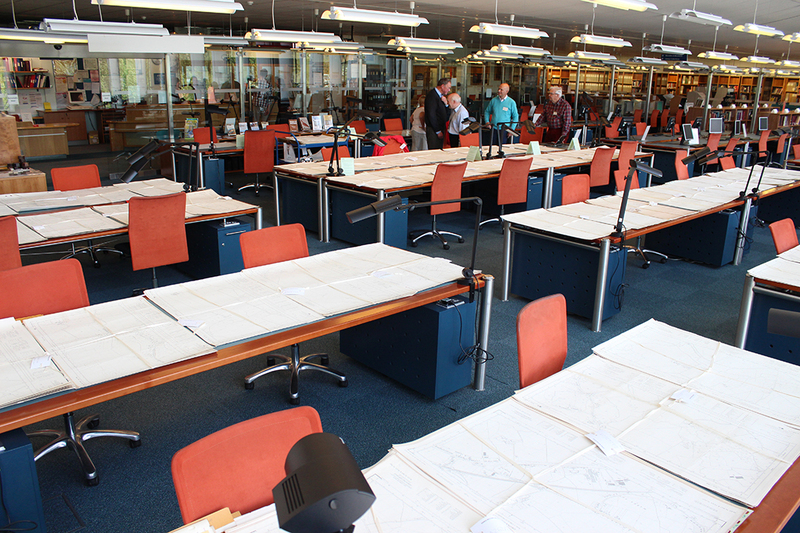 The ERO has a fine collection of late 19th and early 20th century large scale OS maps (1:2500 County Series) available for public consultation in the Searchroom. 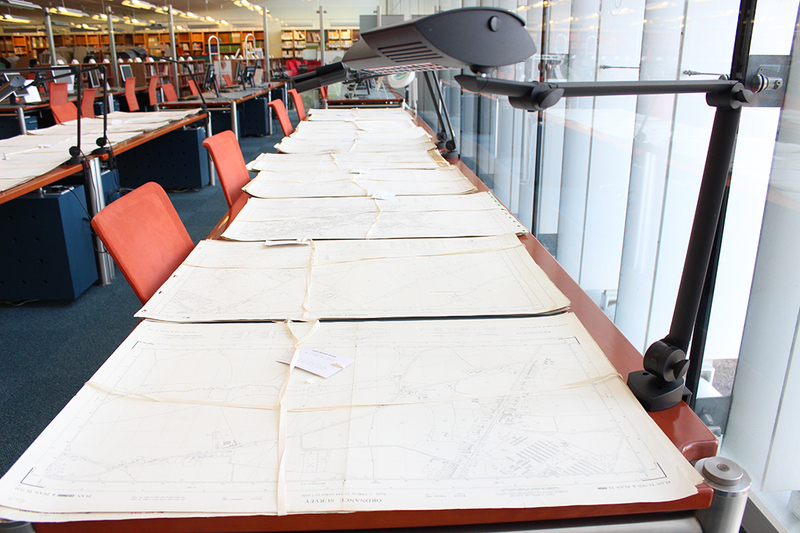 However, we wanted to extend the collection to include later 20th century National Grid maps of the same scale. 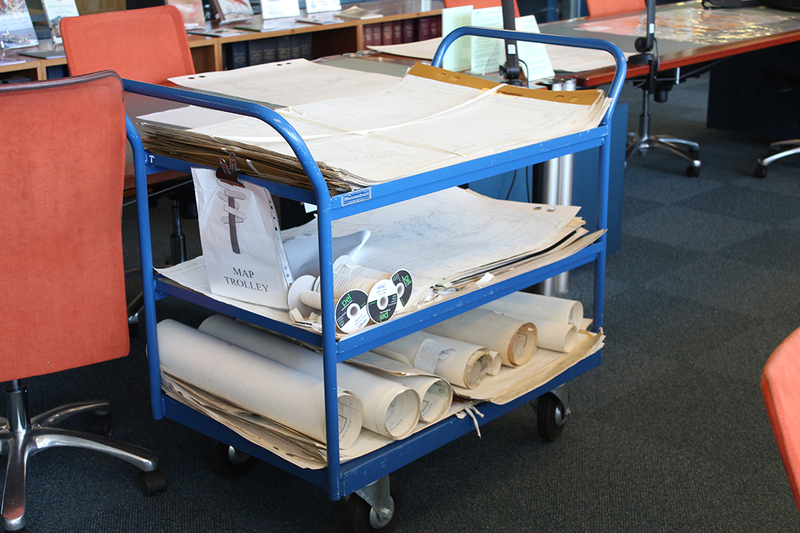 Some mid-Essex maps are available to view but many, among various collections which have been donated to the ERO over the years, remain to be made so. A Map Project involving volunteers has been underway for three years to achieve this and has reached the stage where, having identified and listed our remaining maps and their locations, assessing duplication and condition, we are now ready to select those which will be added to the Searchroom collection. The task is complex though, and involves the volunteers spreading out maps around the Searchroom whilst we are closed on Mondays so they can be sorted. 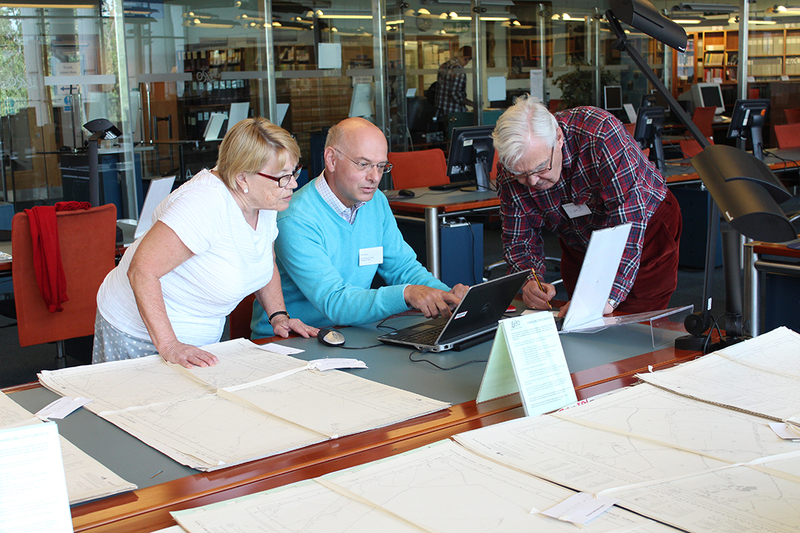 Our team of volunteers comprises Michael and Jane Thomas, who are NADFAS members, John Longhurst, and Andrew Morton who acts as leader bringing his expert knowledge of maps as a former land surveyor usefully to the task. 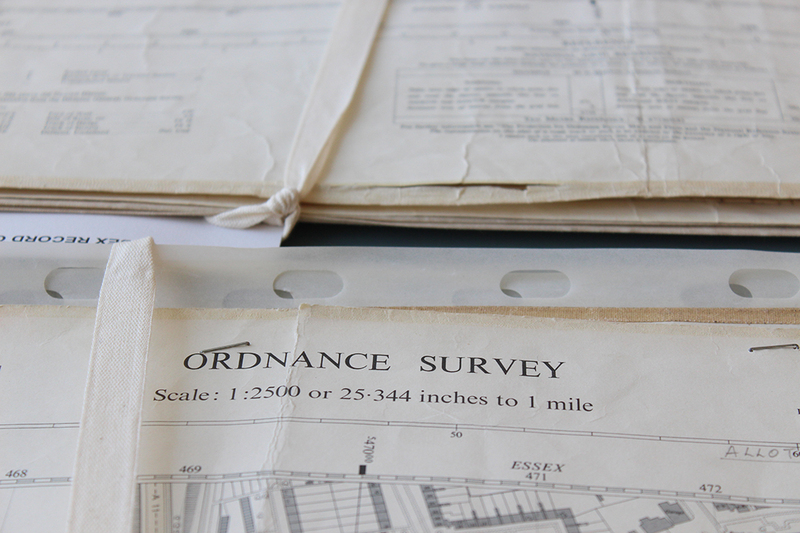 The sorting and listing of the 20th century National Grid maps is a long term project that will take a few years, but we are looking forward to the end result of making our map collection ever more accessible.